Over the next couple of weeks I will bring you images from the 'Open House' weekend. Every September we get the opportunity to take a peek into places not usually open to the public. Some very grand others private property. 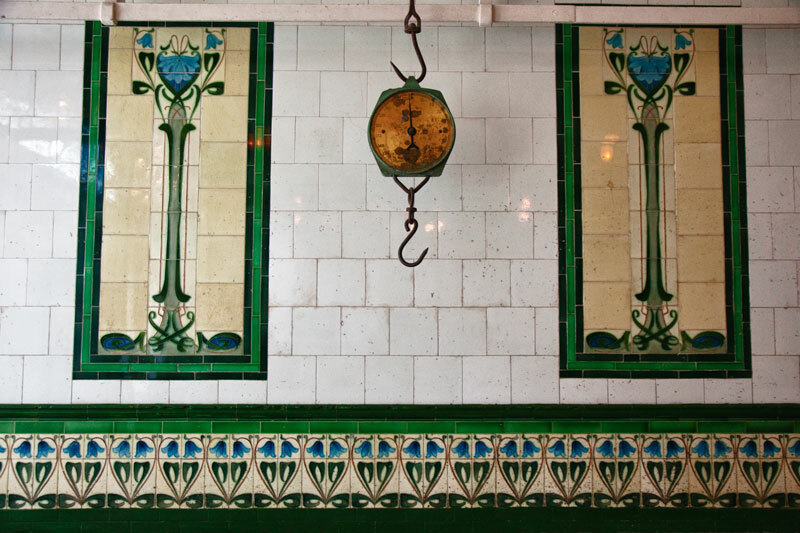 The butcher shop, now privately owned, is a wonderful Grade II listed Edwardian building. Love those art nouveau tiles and original fittings. Love the old tiles. Pity there was no rabbit or pheasant hanging off the hook. That's how I remember these places from 'when I was a lad'. What a treasure of a building Mo, so fantastic that they look out for these old gems. Have a great weekend. Thank you Mo, this is great! Gorgeous! I was sad I couldn't make it to any of the open houses- look forward to your images! I went there on Saturday. Great shop and well preserved and the owner was very happy to answer all our curious questions. Beautiful tiles! I remember sawdust on the floor of the butcher's shop. I love the old scale! Gorgeous tiles. Wish our shops were so pretty. Marvelous art nouveau details. I love the period, but unfortunately it doesn't fit in my home's style. Indeed, those tiles are fantastic! Fab shot! I think the open house thing is like Tyne and Wear Heritage Open Days - which I've missed the last two years :( Hope to get back out there next year! Wow, that tile work is truly exquisite. I really love that! I love the old scale too. I missed out on Open House weekend again as everything was booked up so quickly. It was a bit disappointing!